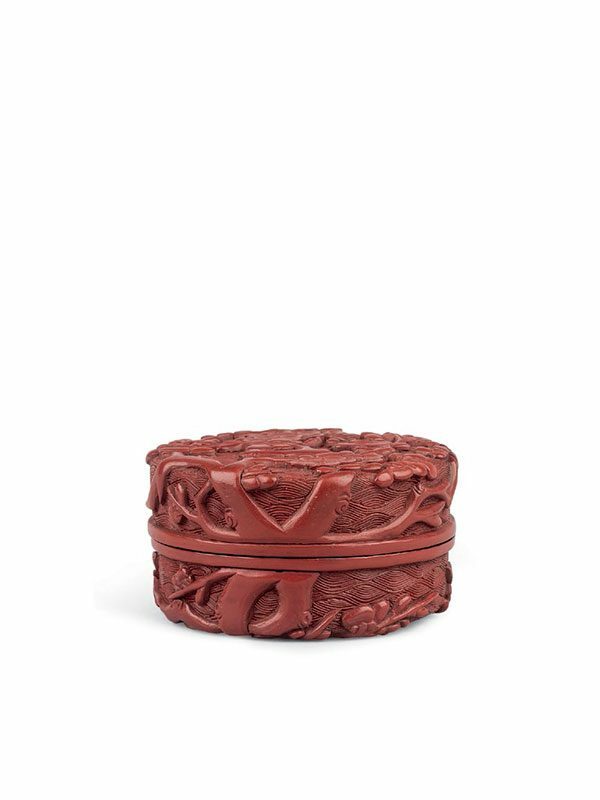 A cinnabar lacquer box of circular form with straight sides, terminating in lipped rims. The flat top and base sections are similarly carved through a thick layer of lacquer with an overall design of plum blossoms and leaves on branches. The naturalistic design is set against a background of finely carved wavy diaper. The interior and the lipped rims are both lacquered black. The decoration of blossoms of the plum tree is emblematic of perseverance and purity, and also serves as a longevity symbol. Blooming on withered old branches, plum blossoms are not only a welcome sight in winter, but also a symbol for vigorous old age. The five petals represent the so-called Five Blessings: old age, wealth, health, love of virtue, and a natural death. This design is very popular on Ming lacquer pieces and can be observed on a mid-Ming dynasty brush pot in the collection of the Palace Museum, Beijing. Small circular boxes such as the present example were used to store incense powder, cosmetics or other personal items. A practically identical box from the Florence and Herbert Irving collection, the only difference being the diaper ground, is in the Metropolitan Museum of Art, New York. 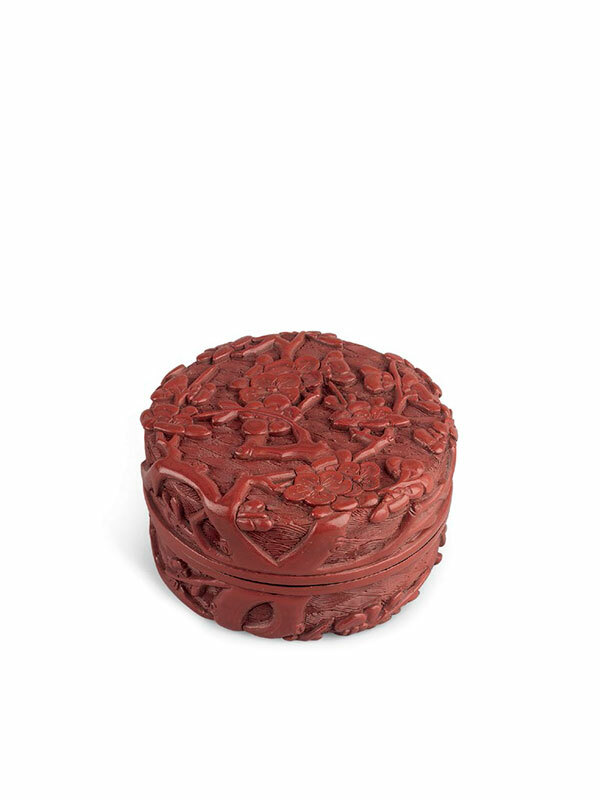 Another closely comparable cinnabar lacquer circular box, dated to the 16th century of the Ming dynasty and carved with a plum blossom design also against a different background, is in the collection of the National Palace Museum, Taipei (fig. 1). This example was in the Qing Court collection and was originally used to store a piece of jade. The Metropolitan Museum of Art online collection archive, accession number: 2015.500.1.102a, b.